Most books on Supply Chain Management simply focus on how to move materials and key resources throughout an industrial enterprise. 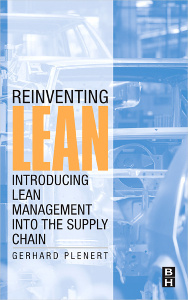 Reinventing Lean shows how SCM can be made “Lean, leading to much more reliable, cost-effective and competitive Supply Chain Management (SCM). In this book, the reader will find a collection of management tools that will help to implement Lean principles, and to understand the components of an integrated Supply Chain Management system. Moreover, the book will show that to make Lean SCM effective, both the functional management tools as well as an enterprise-wide cultural readiness are needed in order to lay the groundwork for a World Class Lean Supply Chain. Reinventing Lean will carefully lead engineers and manufacturing managers on how to adopt a cutting-edge Lean Supply Chain strategy. The book will lay out various proven approaches to incorporating Lean and SCM practices, by focusing on the ways in which SCM relates to materials, money, and information movement within the manufacturing environment. And because Reinventing Lean recognizes that a successful Lean SCM system cannot be achieved unless an organization supports team integration and the willingness to adapt to change, it provides not only the technical tools but also methods for changing company cultural factors that can make it all come together for a successful operation. Chapter 1 - What is a Supply Chain? Chapter 2 – What is Supply Chain Management (SCM)? Chapter 3 - What are the tools of SCM? Chapter 4 - What are the measures of a successful SCM? Chapter 5 - What does it take to create a World Class Supply Chain Environment? Chapter 6 - What is Lean? Chapter 7 - What are the Acceptance tools of Lean Management? Chapter 8 - What are the Technical tools of Lean Management? Chapter 9 - What are the measures of Lean Success?